I would like to have some explanation, as to why Sandbox Radio has chosen the name May Day! May Day! for their Spring Radio show, but I have no great insight about it. Perhaps it is because it takes place on May 1st, a day designed by the 2nd International as International Worker’s Day. A more likely explanation is that it is the universal cry for help when shipwrecked, having originated in the days when French, rather than English was the lingua franca. In French it is m’aidez, meaning HELP ME, but the English render it phonetically into May Day! May Day! Yes, the shows are that good! 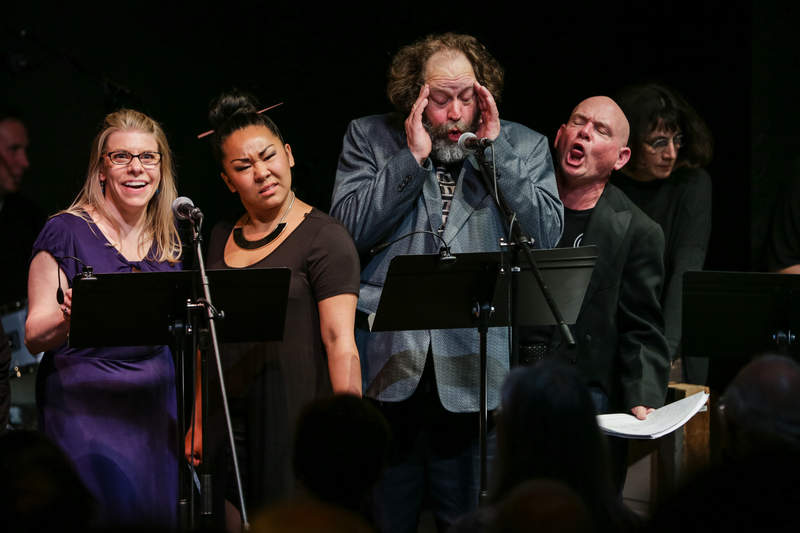 It isn’t just watching the performers; it is also that the audience participates, in this LIVE radio performance, with killer music (figuratively speaking, no m’aidez necessary) and SING-ALONGS. One leaves the show feeling a zillion times happier. I’ve always looooved the irreverent humor, which seems to be in short supply in Seattle these days. Speaking of laughter, neurologically speaking, it has been proved that our brains work better after a good laugh. So, save the receipt and find a creative accountant. Place it in the column of Medical Expenses and call it-Neurological Regeneration aka Humor Therapy and deduct it from your taxes. So, join producers and hosts Leslie Law and Richard Ziman, music director Angie Louise (The Love Markets), the Sandbox Radio Orchestra, special guests Sara Porkalob, Scott Warrender, Gin Hammond, Peggy Platt, Nancy Pearl and your favorite writers and actors for an evening of whip smart locally grown content. May Day! May Day! Sandbox Radio. Town Hall Seattle (Downstairs) 1119 Eighth Ave, Seattle, WA 98101, First Hill. One Live Performance Only, 8 pm. Tickets: for the live performance http://www.brownpapertickets.com/event/2901974.